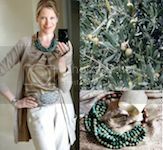 The arrival of the first warm and summery days coincided with the arrival of the new necklaces I was so excited to discover when in Paris last January. 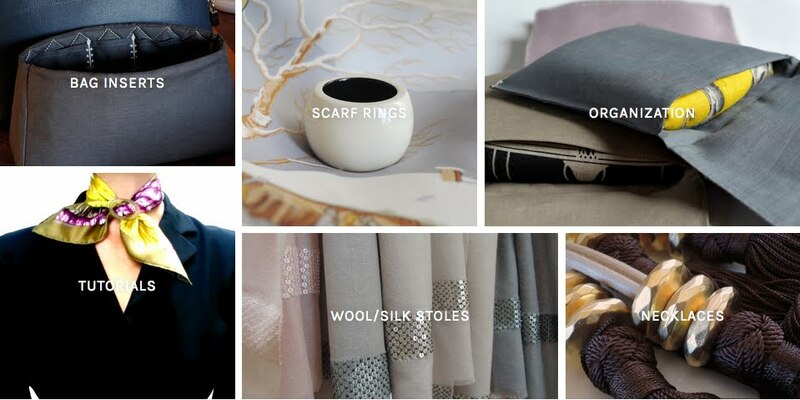 They have clean and contemporary lines, which gives an easy, chic and stylish finishing touch to casual as well as dressy looks. I previously tried them with wintery wardrobe items, and they were fabulous in combination with sweaters, dresses and cardigans. 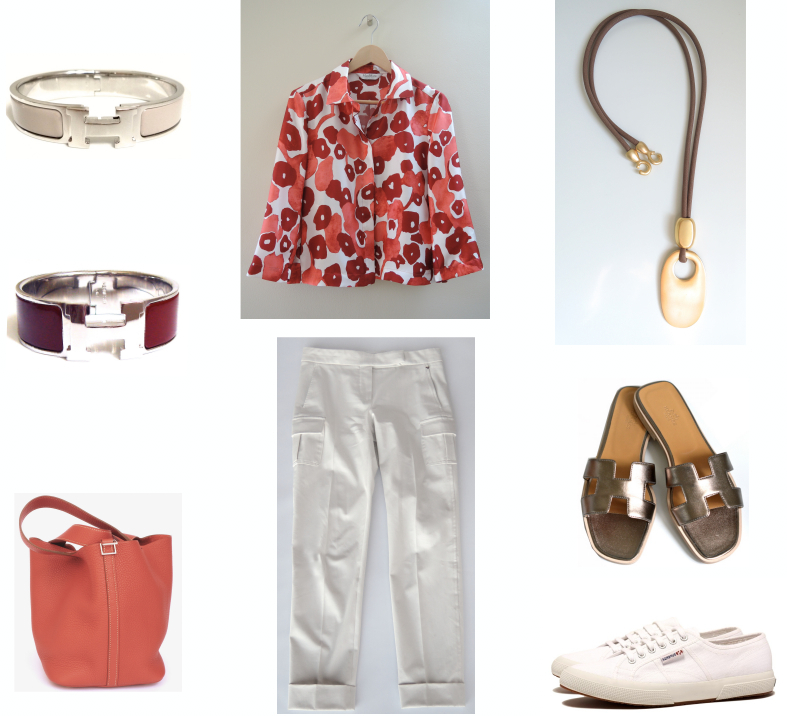 It's been great fun to pair them with spring and summer looks for this post, they are truly wonderful for all year round. The bright and sunny days have also inspired a couple of summer wardrobe purchases. The patterned silk top with abstract red flowers was simply love at first sight. It can be worn as a blouse or jacket, and dressed up and down with ease. The flowers have a lovely variety of shades of red, which makes it easy to combine with other items. I bought it at Max Mara, but couldn't find an online link (according to the label the model number is 1111085200). The trousers (also by Max Mara) are a much needed replacement for a pair of light cotton trousers which came to the end of their life. The b&w printed tunic top is from www.comptoirdescotonniers.com, and gives a fresh touch to black and white summer outfits. It can be worn as a dress, tunic or even a shirt, as it tucks easily into a pair of trousers. Accessories: Pendant necklace in or. 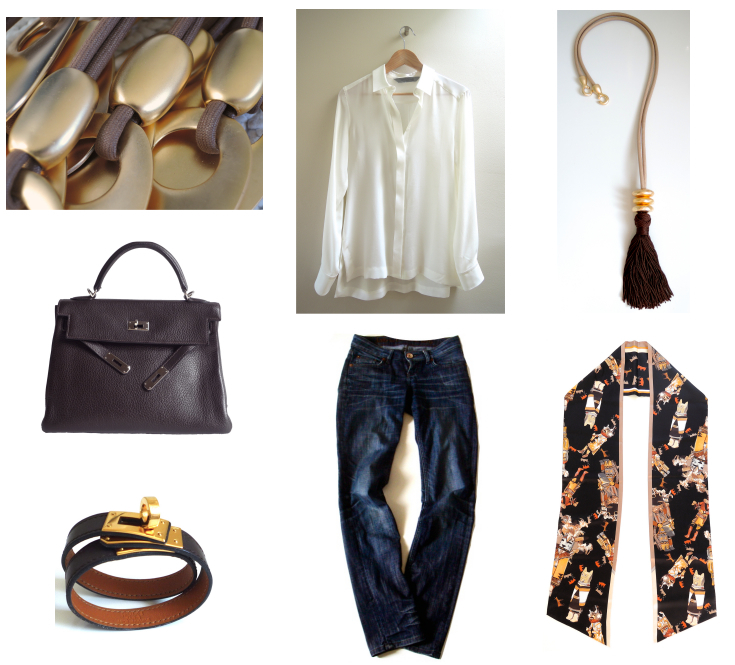 Hermès Picotin 22 in sanguine, Kelly Dog bracelet in black croc, or clic H in marron glacé and Clic clac H in bourgogne. Accessories: Tassel necklace in noir/argent. Hermès Kelly Dog bracelet in black croc or 'Quadrige' enamel printed bracelet. 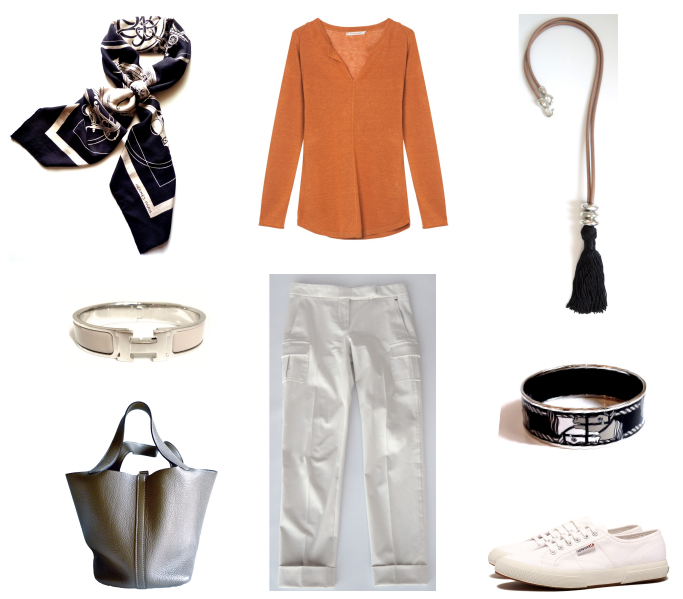 Capsule pieces: Off white cotton trousers and burnt orange linen sweater. Accessories: Tassel necklace in noir/argent. Hermès Picotin MM in etoupe, Clic H bracelet in marron glacé or 'Quadrige' enamel printed bracelet. 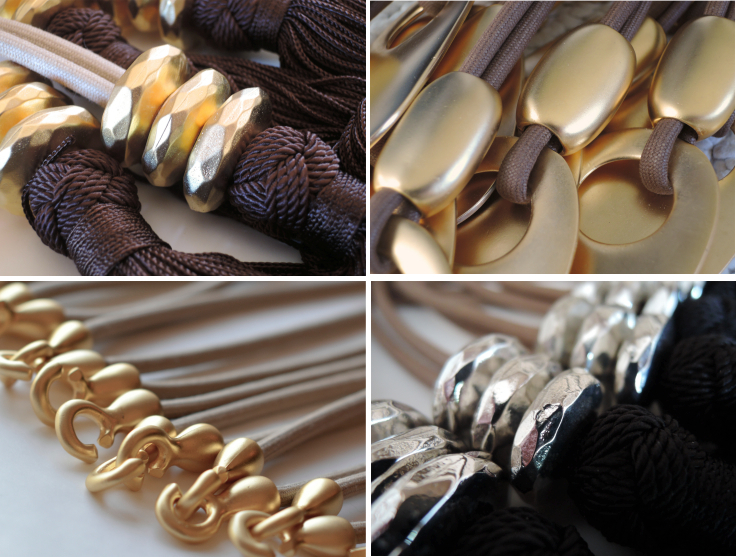 Accessories: Tassel necklace in mocca/or (above) and Pendant necklace in or (below). Hermès Kelly in ebene, 'Quadrige' enamel printed bracelet (above) and Kelly Double Tour bracelet in ebene (below). The necklaces are nickel free and made by hand. To preserve the beauty of the gilded gold or rhodium finish, please don’t let the metal parts come into contact with perfume, and avoid having the surface scratched by friction, or sticky or sharp objects. Oh, my friend, these are so very elegant ànd versatile! Love the richness of these tassel colors and ITA that all three are year round! Also, loving how you mixed the silver and gold as you prepared your style sheets! Congrats on another runaway hit! Your talent knows no bounds...yeah! Those tassel necklaces are so pretty- I love tassels too. You look so crisp and summery in theses photos. Wow!!!! These are smoking hot!! This scintillating montage vindicates GSL in ways that exceed even his high expectations. I totally agree with dear Trudye, "your talent knows no bounds"! These new pieces are so beautiful! So elegant and chic! Congratulations, my dear friend! I love them all very, very much <3! This post is a beauty! You always choose the most amazing photographs to mix with the new items and outfits. You create beauty around you. Thank you for sharing it with us <3. Tu est somptueuse. Toutes ces associations sont merveilleuses . J''adore l'association de noir et blanc et du chemisier avec le jean . Comme toujours c'est un sans faute Bravo!!!!!!!!!!!!!!! Break out the bubbly! Tassles are always festive, and you give us so much to celebrate! Myriam is absolutely right: these ensembles are sumptuous. PS: I watch with fascination the rising tide of gold in your wardrobe! Dear MaiTai, what a beautiful post to kick-off new MT collection additions! After seemingly never-ending winter here in southern Ontario my eyes crave colour, especially lush green and sumptous blooms. Thanks to your pictures we are so fortunate to be able to see what spring should look like! Thank you! If I may bug-in here and say, it's all in your lovely name: beautiful life; the make-up is just frosting on what's inside--good living, good soul and lots of love. that's what makes our MaiTai so beautiful. Nothing I like better than a great tassel! And, these new necklaces are wonderful for summer when just the thought of putting 90 cm. of silk around your neck is nauseating. I've got my order in and can't wait to get it. You are such a clever girl! And, you look lovely in both your new wardrobe additions and the ones we've been treated to before. Of course, with new pairings, they look brand new, as well. May your old light cotton pants rest in peace. How gorgeous you look in that pale lavender top. ITA, Jerrine, as the thought of a scarf around my neck has me in a sweat! I just love these and so happy to have my order placed! I know they will see year round wear! Probably no one understands the heat/humidity/silk equation quite like we do, Trudye. Texas and Georgia; summer and silk just do not work! I so look forward to receiving my order. Yes, the necklace tie is my solution, if I can wear it over a collar, but if the silk actually touches skin, I go a little nuts! Fortunately, AC is everywhere, but it's just getting from one air conditioned spot to another that's miserable. And, God forbid if you have to get into a car that's been sitting in the sun all day - maybe about 120 F. in there. Scarf is immediately whipped off! FF, I forgot that you battle the same heat and humidity we do - only worse. At least you're headed into your fall and winter now, right? I know we've got a long, hot summer ahead of us - ugh. Thanks FF...what would we do without the air conditioning? You are right, you can make it work in a chilly building. I even use my shawls in the summer to ward off a chill...especially at the movies where I am sure they keep the temp right at freezing or just above! If I wear a scarf at all in summer I prefer the 70cm...less to mess with and easier to take on and off! MT scarf rings do help,no? I always need a scarf or shawl at the movies! In summer 70cm is perfect! Yes, the humidity does play havoc on the hair! Jerrine has the frizzies and I have the dead straight flat head! Yet, your hair always seems to look fab FF! What is your secret? At least the humidity is good for the skin...yay! Mine isn't either, FF, and I doubt Trudye's is either. And, I battle hair frizz all the time - I hate it. You can't look totally chic with frizzy hair! Nope,Jerrine see above comment! My hair just goes flat in this humidity! Waiting to see what FF has to say as her hair always looks good! LOL, Trudye, I was commenting that I doubt your autumns are too cool either! Our posts passed like ships in the night, I guess. But, I'll trade flat for frizz any day you're up for it. Our seasons here are so darned mixed up,I am not sure what to call them! Would you believe I have always longed for a little frizz to give my hair some oomph? Sigh . . . and, I'm always trying to calm down the "oomph." You speak reality (for me) when it comes to 90cm silks + summer = icky sticky. MT's pendant necklaces on cotton chord are really just the ticket! and for what it's worth, I think frizzy hair is just so kool and interesting. alot of people perm their hair for more volume, so think of it as instant, Nature-given volume that doesn't require chemicals! she is the uber of uberest kool w/ superfrizz hair and all! Just Googled Esperanza Spaulding: now that is SOME HAIR. Jerrine, I can see that you might not want to go all the way down the pike, but I'm with sammie on liking some of that summer humidity volume, at least on me. I just call it "beach hair." Bring on the sarong and the rum-based drinks! Love the new necklaces! And the pairings are inspiring, as usual! I quickly ordered the pendant necklace and look forward to wearing it very soon. Hello Dear MaiTai! 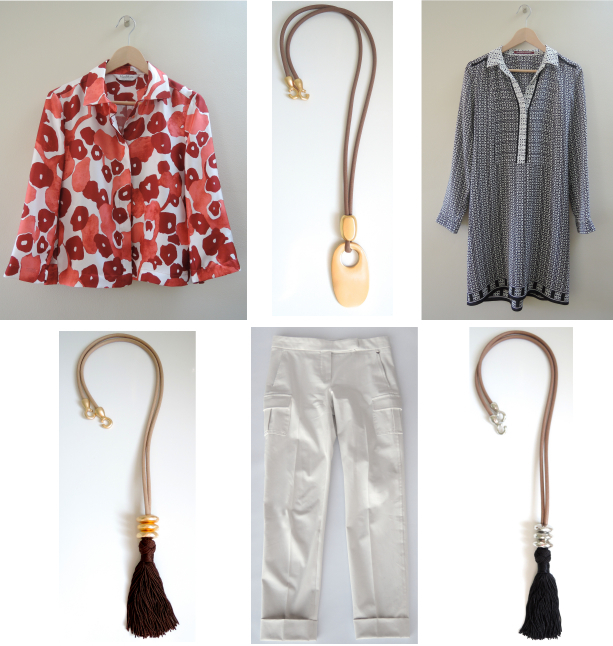 Love tassels, your new additions are so lovely...the perfect accessory for the warmer weather, or anytime of course. How pretty you are with your new acquisitions and new neclaces. I also love the MM pattern but also this old one light blue blouse. I personally think that your thin body, class and taste together are a "régal pour les yeux". And put something more in the way of the all accessories you wear. As usual with my approximative English it's a bit confuse... But you understand I hope my dear Mai Tai. How lovely the new necklaces are! Suitable for both warm and cold weather - I can (roughly) imagine how you would combine them with both summer and winter wardrobe ("roughly" for the reason your imagination and style are unpredictably beautiful and you can always surprise by the new stylish idea and never get tired). In my world of style (much upgraded by your site), the new necklaces work for sure fantastically in the coming warm days, although you are my only style teacher and I am not a fantastic pupil. Thank you for the new fantastic contribution in your inspirational cute stylish boutique teaching us how fantastic journey is evolving the personal style, if the creator is skilled. Wow, knock us out w/ a feather!!! Your new modern necklaces on a soft cotton chord are so uber cool, literally and figuratively, and another point: matte/brushed gold finish, rather than shiny shiny--that's a MaiTai detail that, IMO, makes these pendant/necklaces special + subtle. MaiTai, your photos belong in a museum, truly. The field of red flowers (poppies?) remind me of Monet's painting showing a landscape, dotted in Vermillion red poppies. Thank you for sharing w/ us your newest creation, no doubt designed and refined w/ much love and devotion. you make this world more beautiful in every way. Sammie, may I say "thank you" for expressing my thoughts in right words? That's true - the necklaces are special for their special and thoroughly studied details. It makes them different and special. All the things which are not "complicated" but are perfect in details and craftmanship are so special. Like these necklaces. Thanks, MaiTai for creating them and Sammie for describing them so well. Thanks for your generous thoughts and kind words. Means alot to me...but I must say, the words come naturally from MaiTai's work. You are so spot-on about the simplicity speaking for itself. Sort of the 'zen' of good design, bcuz simple lines/shapes cannot hide flaws of any kind. Simplicity is "all exposed" for what it is, and that is not easy to accomplish in any walk of life or product. Also, another point that I adore about this necklace--the smooth curves all around. No sharp corners or edges. It just *looks* so soft and pleasant to touch, even in the photos. and dear Lea, I'm sorry the green shoe search came up 'extinct species' !!! I think there's a reason manufacturers don't make shoes in this color...but our MaiTai has shown us how to style them w/ her GENIUS style sheets. if you happen to come upon something green/aqua/blue or the like, or heck, forget the shoes, if you are still open to joining our kooky green shoe capades, pls reconsider, sans shoes, but w/ everything else in mind/heart. We're not picky about the inclusion of each and every piece; we just want everyone to have fun and enjoy what our wonderful, genius leader Tai has presented to us. That's really the point - enjoy and have fun. I'm still trying to rope Jerrine into this too, so if you get to 'talk' w/ her, please nudge her into our green style sheet challenge too ! Oh yes! Dear Lea (and dear Jerrine! ), sammie has been working miracles. Do consider coming and taking a peek. Sammie is doing a fabulous job of putting together something that we can "give back"! We'd love to have you in on the fun -- and the bouquet of thanks! Many hugs, and hopes that one of these gorgeous necklaces finds its way to your house! speaking of which...how about a series on this fab pendant necklace? It's so practical for summer, as temps heat up, as I don't like a silk twill sticking to my neck when it's 90 degrees outside. I did send a rather weak contribution to sammie a few days ago, but I'm afraid that's about all I can contribute at this point even though I'd love to come play with you stylish green girls! I can't wait to see what you and sammie and Kendal have put together. Don't keep us in suspense too much longer, okay? Jerrine, my dear, your contribution was priceless -- more wit & wow per square inch than I've seen in a long time! sammie is an amazing dynamo, and has been accomplishing miracles. I think we're getting close to the point for a pass-off to Swan-in-Chief MaiTai -- the suspense is building for us, too! Hoping for a green light soon!!! I noticed less silks than usual incorporated in the posted outfits, I hope it is not a departure but rather a way to highlight new additions, both the capsule pieces and the MT collection treasures. I cannot wait to see the new pieces joining your (and our) favourite silks to create the masterpieces of stylish outfits! I just had to come back and admire your new pendant necklaces. The weather in my part of the world is starting to warm up, and to be honest, I rarely wear my fine shiny silk twills around my neck as the temps heat up. It's just too sticky, icky and the lusterous silk twill fabric doesn't go well w/ my lightweight madras cottons and linens. Ohhhh, your pendant is on a cotton chord--comfortable in summer. Genius MaiTai, I tell ya, pure genius! I'm with you here, sammie. Silk scarves and humidity are not a good match at all, and also, I think they can just plain look too hot. The necklace tie works pretty well, but for the most part my scarves go on sabbatical until late October. I hate it but, that's life, and I love pulling them out and wearing them again come fall. The new pendant on cord will probably be worn every day until the scarves can come out and play again. I'm just so glad that MT designed it for us! Thank you, MT.